How Do I Find the DNS Server Being Used By My PC? - Ask Leo! The DNS servers used on your computer are most likely specified by your ISP. I'll look at how to tell which servers they are and why you might consider changing them. The DNS (Domain Name System) server used by your PC provides the service that maps domain names (like “askleo.com”) to IP addresses (like 67.227.211.203). There are several different DNS servers your computer could be using. I’ll look at how to quickly find out which servers your computer is configured to use, and then I’ll discuss a couple of situations where you might want to use something different. In Windows 10, right-click on the Start menu and click on Command Prompt. In most other versions of Windows, click on Start, then All Programs, then Accessories, and finally on Command prompt. Type “ipconfig /all” followed by Enter. You’ll get a lot of information. There may be several networking adapters. Look for the one with a recognizable IPv4 address, most often starting with 192.168 — an IP address assigned by your router. In the example shown above, the IP address is 10.1.10.177. In the midst of the information, you can see “DNS Servers” listed. Typically, there are multiple servers that provide backup access if one fails to respond. In my case, I have several DNS servers listed: two IPv6 addresses and an IPv4 address, all pointing to my router, plus three IP addresses for external DNS services. Yours will almost certainly be different. It simply passes on the DNS information it was given by your ISP. It returns its own IP address, meaning that the router itself will act as your DNS server. It returns a combination of both, as you’ve seen in my example above. When a router acts as your DNS server, it can result in a speed improvement. Each time a DNS request is made, the router remembers the answer. Then, when a request for the same information is made again — a common occurrence — it can simply return the response it already knows without needing to reach out to a DNS server on the internet. 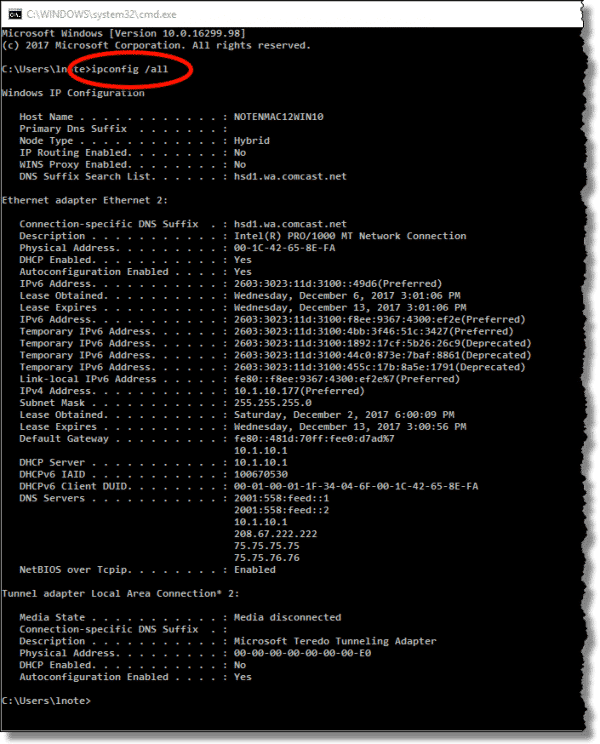 If you find that your computer’s DNS is set to be your router’s IP address (most commonly a single DNS server is listed, and it’s the same as the “Default Gateway” listed in the ipconfig output), then to see what DNS server you’re really using for requests that the router can’t fulfill, you’ll need to check the router’s configuration. Exactly how you do that depends on your router, so check the documentation that came with it. In most cases, it’s quite appropriate to use the DNS servers provided by your ISP, but you’re generally not required to. There are two reasons to consider alternative DNS services: speed and security. Some public DNS servers are designed to be fast. Perhaps more pragmatically, some ISP’s DNS servers aren’t designed to be fast; they’re just in place because the ISP is “supposed” to provide DNS services. Switching to a different service can speed up a DNS request’s response time. If you find it consistently takes a long time the very first time you visit a web site, or you see phrases like “resolving <domain name>” in your browser’s status bar for a long time, then trying a faster DNS service might be an alternative. Google’s Public DNS is one such service. DNS services such as OpenDNS and the new Quad9 (named after their base DNS server IP address: 9.9.9.9) add an additional service: security. Both block known malicious sites. If you have malware, or are in the process of falling for a phishing attempt, these services can protect you by blocking or redirecting a request that would land you on a site known to be malicious. OpenDNS also has additional adult-content and custom filtering available. Alternative DNS servers aren’t for everyone, and they certainly aren’t required, but if you’re experiencing a DNS-related speed issue, or are looking for additional protection, they might be worth investigating. I’ll review how to change your DNS settings in a follow-up article. How Do I Change the DNS Used By My Computer? - Sometimes using a DNS service other than that provided by your ISP makes sense. I'll show you how to make the change. « Previous post: Is Windows 10 Still Free? Will changing the DNS server cause problems with my IPS, such as lost connections, downtimes, rounting mistakes? Changing your DNS server shouldn’t cause any problems. In my local home lan I had an issue with this name resolution process. At least once every day my local router (thats was acting as a dns server for all local PC’s) stop answering the dns requests, and I had to reboot the router or just renew the dhcp negotiation between the router and the ISP as a workaround to restart the dns server operation of the router. Today I decided to change the config in the router and make it to send via dhcp to the local lan PC’s the ip of the dns servers he learnt from the ISP instead offering itself as a dns server. I’ll see tomorrow if this really works. Have you seen or heard of a problem like this with a router stop answering dns requests after few hours working fine?. I don say it is answering with a wrong IP, I say it is not answering at all. BTW it seems this problem is not only for this router. Before this one ( a TP-Link) I had a Linksys with the same symptom. I changed my DNS a while back because I found I was no longer able to access a major government website, which I need regular access to. Does anyone know why a major website like that would suddenly become completely unavailable to a DNS? I wonder if the site you were trying to reach had changed IP Address and the DNS server you were originally using had not updated it’s A & PTR records. A suggestion for questions such as this: If you want a relevant response that might help resolve your problem, then provide some relevant information. In this case, what was your old DNS? What is your new DNS? Are you sure you did the change correctly? Did you flush your DNS cache and restart your router after making the DNS change (see Leo’s link above)? What else did you change when you were changing the DNS? Did you change any settings in your firewall or antivirus? Did you change the DNS in your computer or router? Or did you just click on some link, on some website, that promised a faster internet (which website)? What kind of error message do you get when you say “no longer able to access”? What government web site? Did you try accessing the government site at different times (to see if it may have been down previously)? Did you try another browser or computer? Did this failure to access the government site occur immediately after you changed DNS or did it occur at a later time after you changed to the new DNS? Did you check the government link to see if it’s old or mis-typed? Did you change the DNS back to the previous one to see if you can again access the government site? Are you sure we’re talking about “DNS” and not “ISP”, or something else? A great tool for modifying DNS settings, or to benchmark a series of DNS servers is DNSJumper from Sordum. The web site is (http://www.sordum.org/7952/dns-jumper-v2-1/). HI. Im tethering and sharing my internet to my pc with my phone. (I’m using simcard to access to internet and Im using usb wifi adapter) my question is should I change the setting on my phone or my computer because whenever I’m changing the settings on my computer my dns server on cmd do not change to that servers ip.